Aviva is thrilled to be returning to TPE for her first summer on staff, after spending six amazing years there as a camper in Middle School Ensemble, High School Ensemble, and Traveling Troupe! Outside of TPE, Aviva acted in and directed many shows at her high school, the Edmund Burke School, as well as danced in and choreographed for a local Israeli Dance troupe. During high school, she also spent three years working as a teacher’s assistant in a nursery school. Currently, Aviva is a freshman at the University of Michigan, leaning towards studying Psychology and Community Action and Social Change, as well as working towards proficiency certification in Spanish. 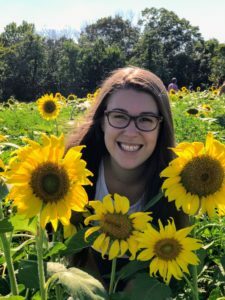 When not studying at the library, Aviva volunteers for the Prison Creative Arts Project, teaches Hebrew at a synagogue, serves on several Hillel boards, and does shows with on-campus theater groups. She is beyond excited for another summer filled with theater, nature, and s’mores — and to meet all of the fantastic campers!